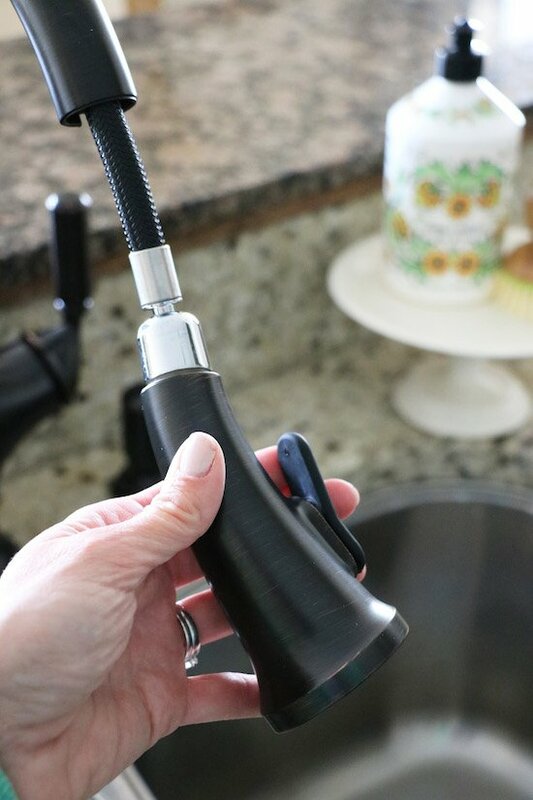 New Faucet and a DIY Kitchen Sink Organizer - Sincerely, Sara D.
I was excited at the opportunity to work with Kohler and even more excited when I saw their Kohler Worth Kitchen Faucet in oil-rubbed bronze. 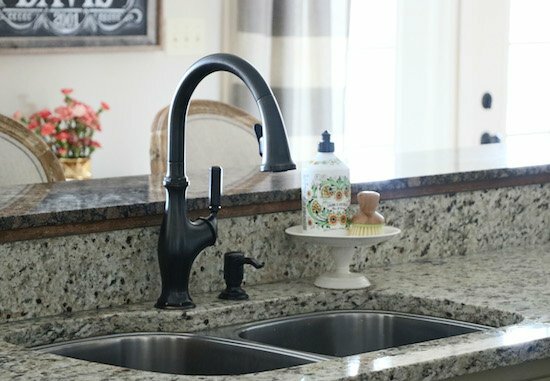 I have always thought a darker faucet would be perfect in my kitchen since it would fit my vintage style and look better with our darker appliances. 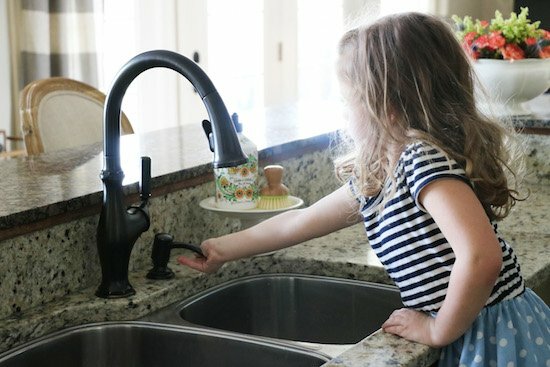 Kohler has an array of beautiful faucets that fit any decor like the Kohler Trielle Kitchen Faucet and the Kohler Sous Kitchen Faucet. We had a nickel faucet before and plenty of kitchen clutter next to the sink. 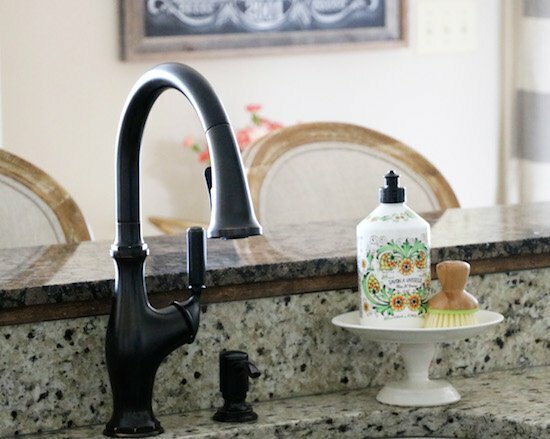 The new Worth kitchen sink has the handle on the faucet, so you can put a soap (or lotion) dispenser where the handle once was. 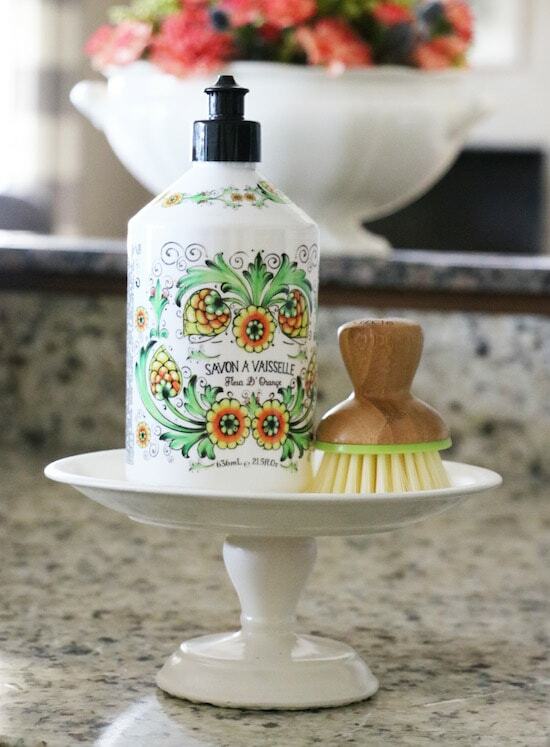 Besides removing my soap containers, I also created a DIY kitchen organizer for my scrubber and dish soap. I love the more organized cleaner look! 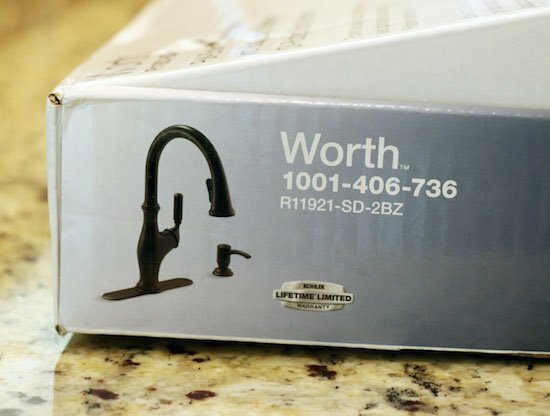 I found my Kohler Worth Kitchen Faucet at Home Depot. 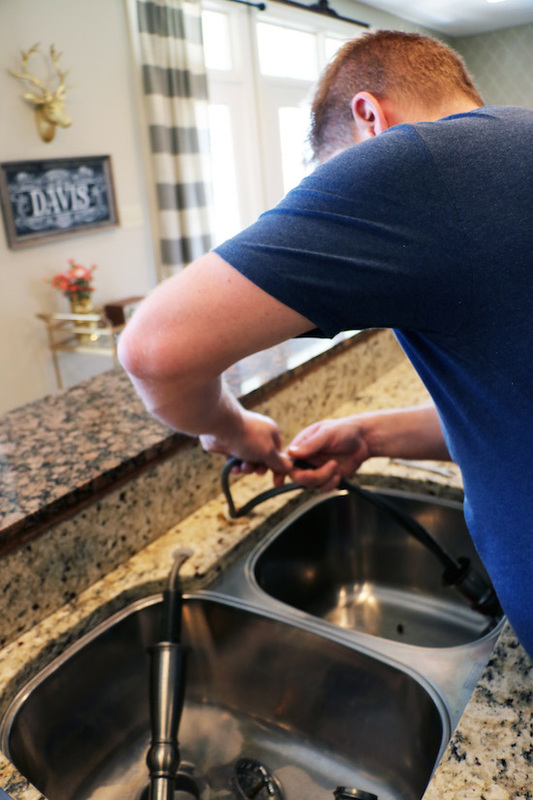 It was easy to install, and we moved our old faucet and installed the new one in under one hour. 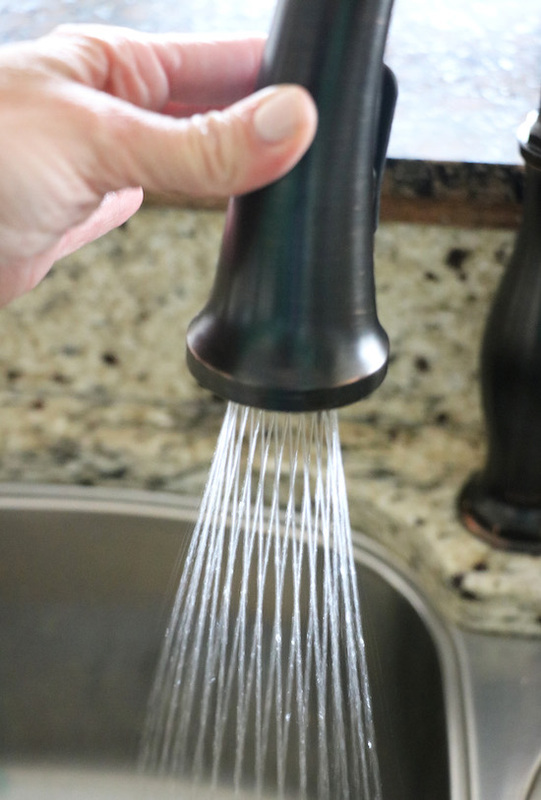 This faucet has so many great features including the 2-function spray head which features stream and sweep – a wide forceful spray that makes cleanup easier. And the spray head stays in place through Kohler’s signature magnetic docking system. I am a huge fan of the soap dispenser I mentioned earlier. 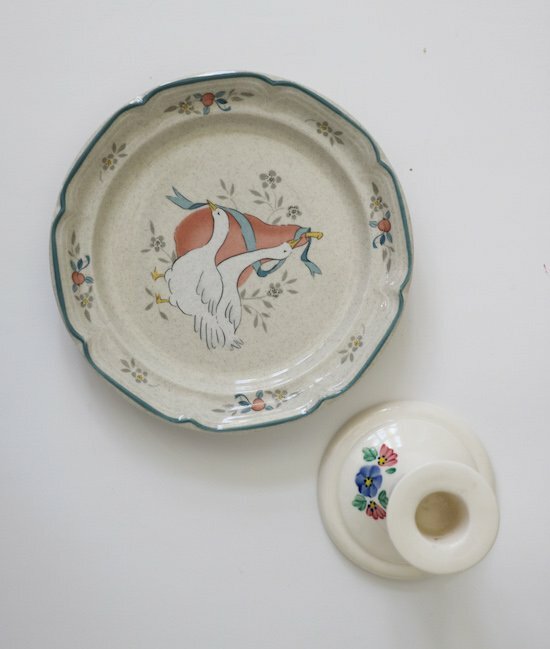 Less clutter is always good! 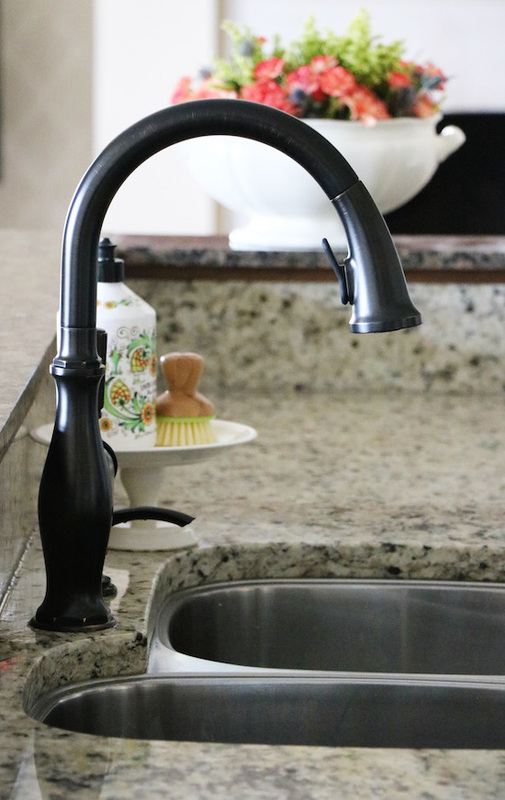 Besides loving our new faucet, I love the look and functionality of the raised dishes next to the kitchen sink. They look pretty and organize essentials. I decided I could easily DIY my own kitchen sink organizer using old plates and candlestick holders. 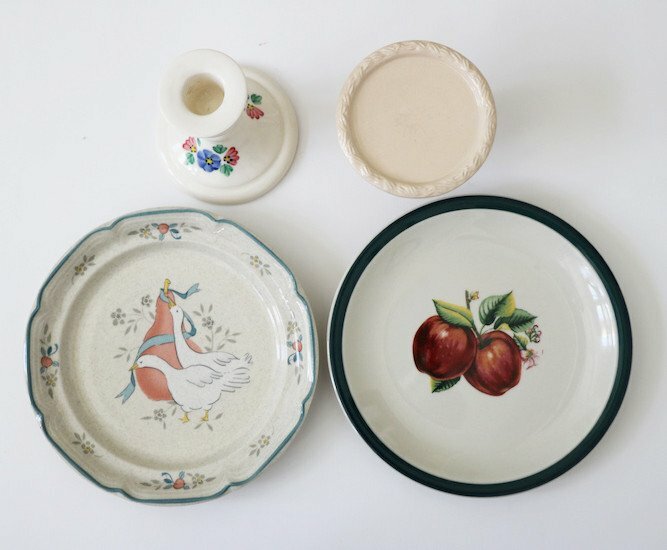 Thrift stores and garage sales are full of random dishes. I found all of these at Goodwill for around $5. To DIY your own kitchen sink organizer, find a plate (I used a smaller salad plate) and a candle holder. 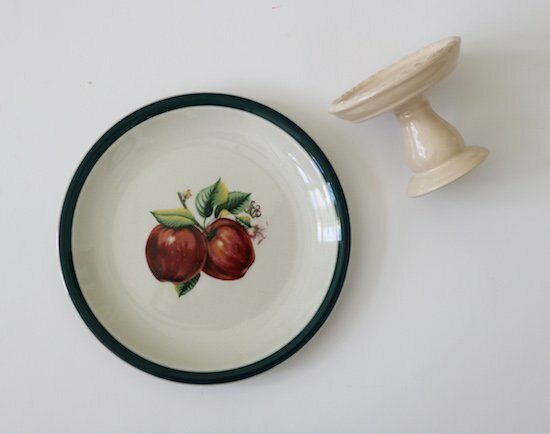 I decided I needed two – one for my kitchen and one for my bathroom! 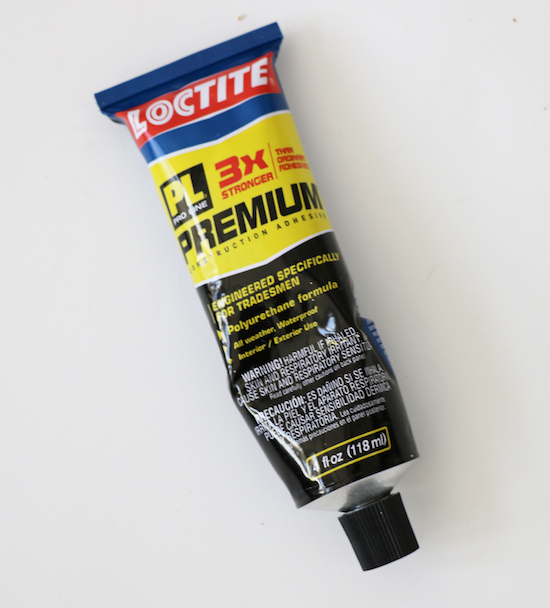 Next, find a strong glue. 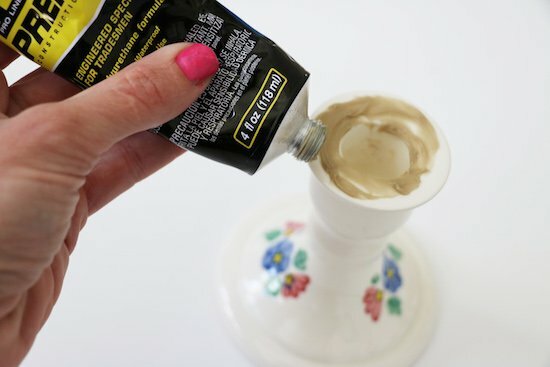 Add glue to the top of the candle holder. 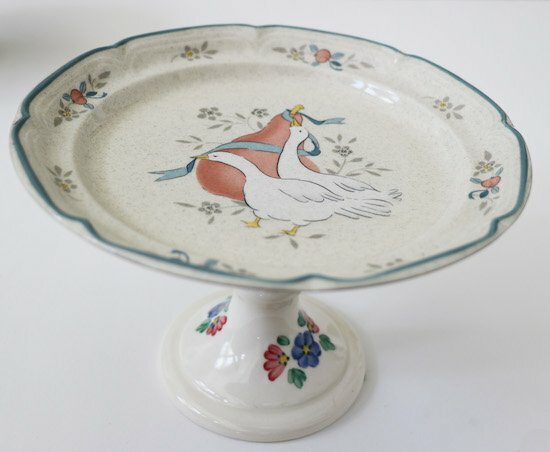 Set the plate on top of the candle holder and glue. Allow to dry according to the glue’s instructions. 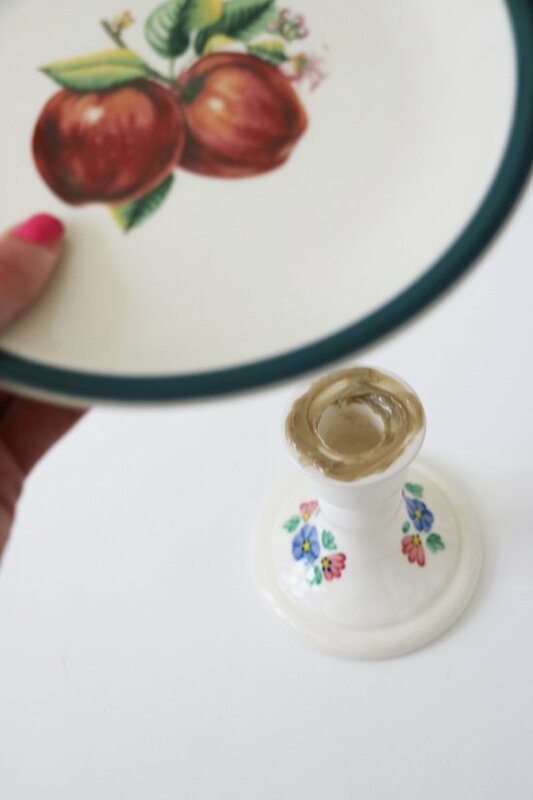 Once the glue is dry, you can paint. 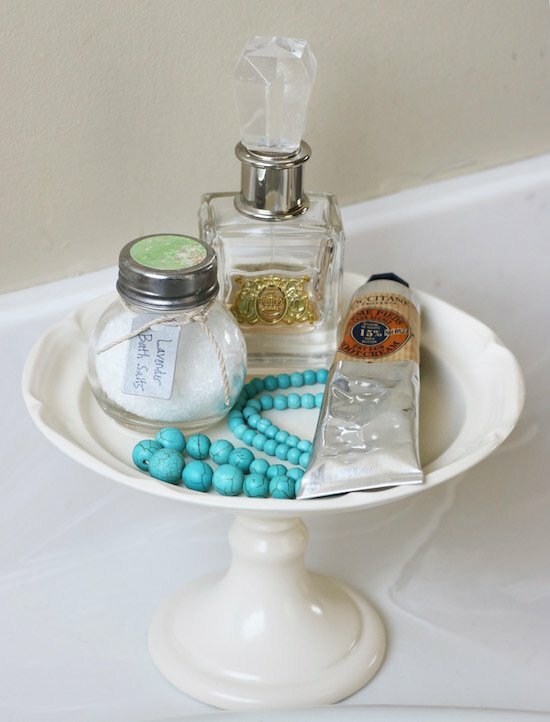 And once your paint dries, you can use your pretty organizer(s)! I don’t think I would mind doing dishes with that faucet. Absolurely darling! 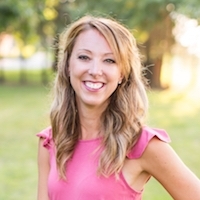 Would make a great gift or party favor for any occasion! Thanks for sharing. 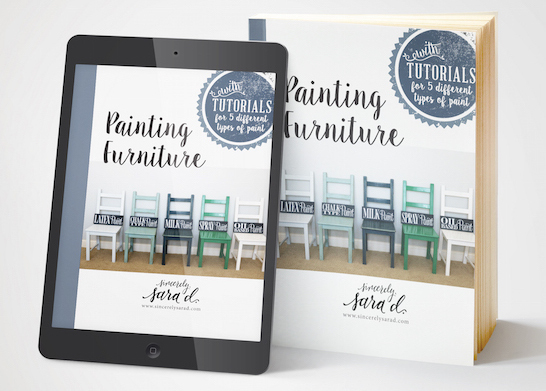 Did you use a special glass paint? What brand? I just used regular old spray paint! I don’t remember what brand I used, but I usually buy rustoleum or valspar’s brands. 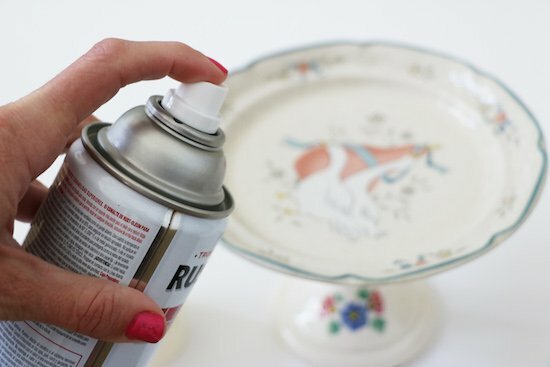 Keep in mind you can spray paint something for food use, but it work great on decorative pieces! 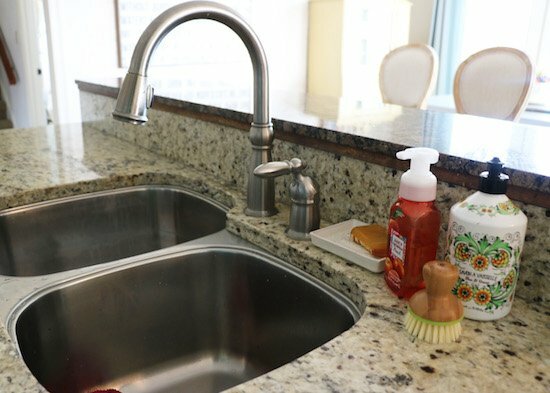 Hi, I came across your blog while researching this faucet and was wondering if you could answer a question. In your installation, what is the distance between the faucet and the soap dispenser? I will have a hole available to the right of the faucet, like yours, once I remove my old sprayer but I’m wondering if there is enough space in between. Thanks in advance. Also, I wanted to say that while your old faucet was perfectly nice, getting one in a darker finish was a good call. It goes great with the stone!